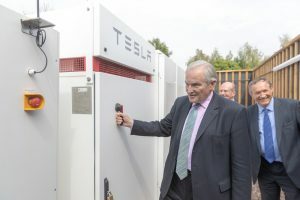 On Friday (1st June 2018) the Project SCENe partners hosted his Right Honorable Lord Henley at the Trent Basin to officially turn on the landmark community energy battery. Our thanks again to Lord Henley for this. Trent Basin battery turn on with Rt. Hon. Lord Henley. The 2.1MW battery will help revolutionize local energy systems. 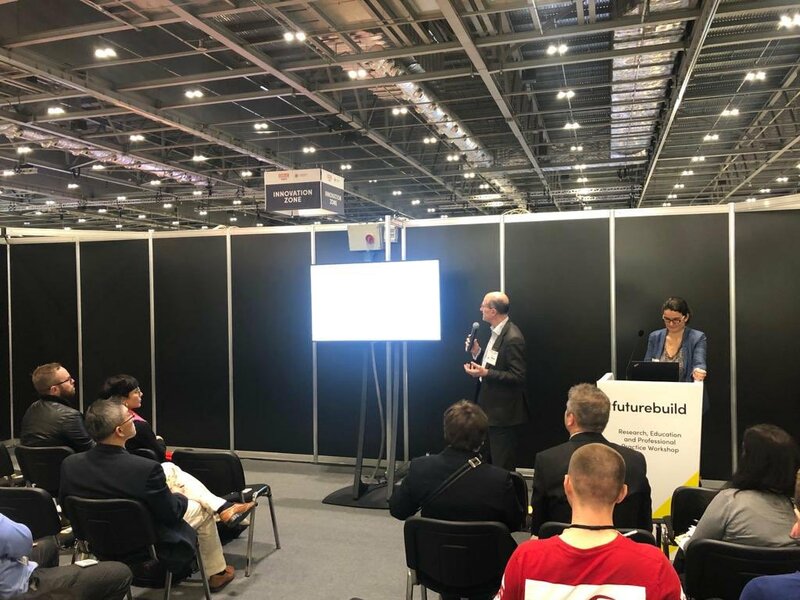 Lord Henley is the Parliamentary Under Secretary of State at the Department for Business, Energy and Industrial Strategy. 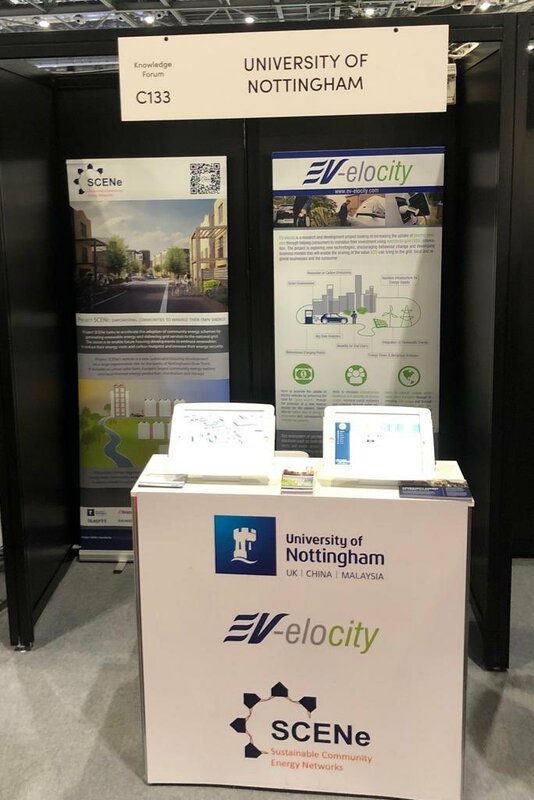 The event was attended by a representative of the Trent Basin Resident’s Association and key partners of the project, including leading energy accelerators Innovate UK and ERA, and the key members on the project from the University of Nottingham, Blueprint, Evoenergy, AT Kearney, Core Control Solutions, Solar Ready and SmartKlub. A press release of the event is here. This battery is discussed in further detail here. It is one of many unique features of the Project SCENe model that come together to offer a better energy system for communities, the country and the environment. 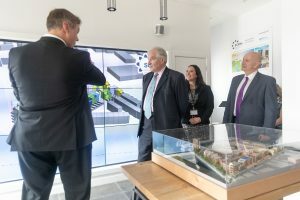 The potential of the model to advance such essential improvements are reflected in the policy-level and media interest in the work being showcased at the Trent Basin. Media footage from Friday’s event is here and BBC news coverage is here. 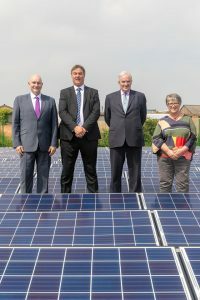 Lord Henley with Professor and Chair of Sustainable Energy at UoN Mark Gillott, Professor Nick Miles and Councillor Sally Longford at Trent Basin’s Urban Solar Farm on Friday 1st June. The event last Friday included a tour of the other energy assets provided by Project SCENe at Trent Basin. 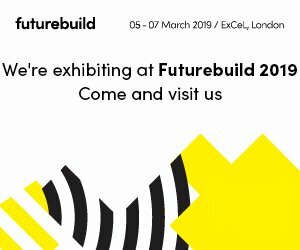 These include an urban solar PV farm, a community energy hub, providing a physical space to interact together and around matters of energy and sustainability, and smart technology for in-home and community-level use to improve how we and the public engage and interact with energy and shift to more sustainable energy and demand management practices. A similar tour is being offered to the public and is bookable here. The first of which is being held to coincide with Sustainable Energy Week for us to contribute to this international sustainability campaign. Links to this tour and other events on that week are provided here and here, respectively. Join us and get involved via those links and via our Stickyworld, Facebook and twitter pages. 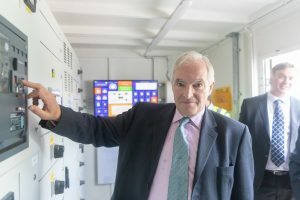 Energy interaction technology being displayed to Lord Henley at the Community Hub along the river at Trent Basin. « Electricity network operator WPD featured Project SCENe in their recent journal.